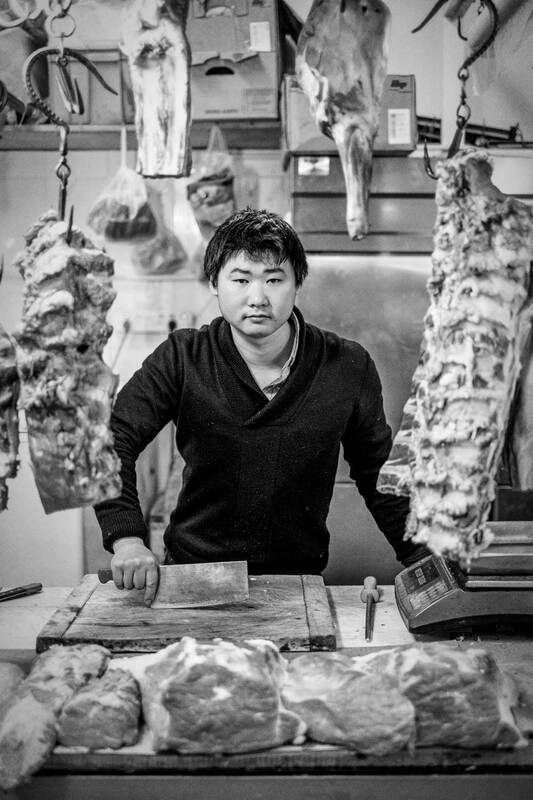 There is Show and there is Tell, and Chinese knife skills are both. By Tell, I mean the explicit, unambiguous schematic details. The goal of Telling is reliable reproduction; its method is precision. In Tell World, there are no secrets – there are no shadows. The blueprint is made public; the information is available to anyone who wants to possess it and has the wits to understand. Tell lives by rules; these rules are implacable. Tell serves – unwaveringly – and that is all. Tell is plain and sere and juiceless. Tell does not shout, does not hint, neither scolds nor smiles. Tell explains, in measured and even tones, how to and why not and just so. It is effective and usually efficient, but Tell is not afraid to repeat itself. Because Tell doesn’t assume that you know much, its arithmetic pace can feel tiresome. “Get to the point,” we may think. If Tell is written, we may skim and skip. If Tell is spoken, we may itch to fast-forward. But Tell is responsible for the whole truth. Tell walks in straight lines and turns at right angles and does not take shortcuts. Show, on the other hand, demands your attention. Show paints on the canvas of your mind, fires up your mirror neurons, hams it up. Understanding is the destination, but between here and there, let’s digress, let’s play and laugh, let’s soak ourselves in context. Show whisks you off your feet. By the time we arrive at understanding, we won’t remember how we got there – and even if we lose our way, we had fun, right? Show is getting impatient with me. Enough talking. Show grabs you by the chin. Look here. Open your eyes and get ready to see. 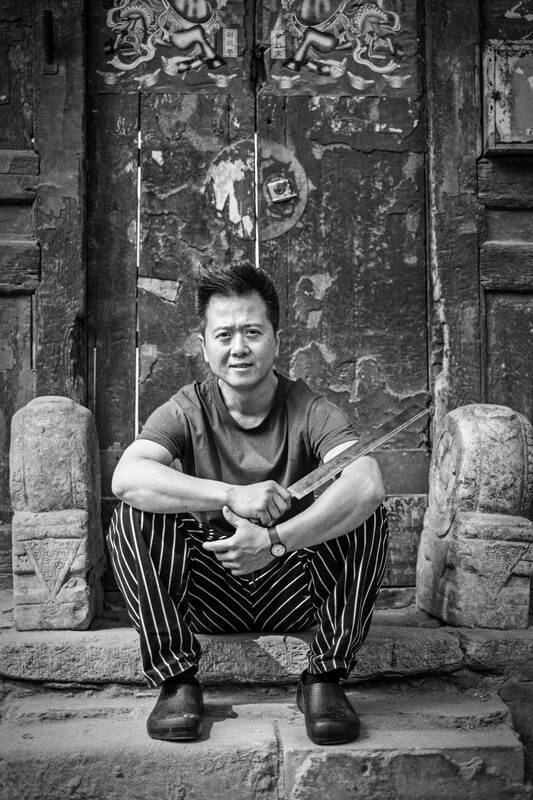 The paradoxical complexity of Chinese knife skills first became clear to me when I flipped through the pages of an encyclopedia of Sichuan cuisine. At first, it all seemed quite simple. Across the millennia, Chinese cooks have apparently decided that there are but four main ways of cutting an ingredient: 丝 (“thread-like”), 片 (“flat, thin slice”), 块 (“chunk”), 条 (“long, narrow thing”). Although there’s no reason that the individual shape names within each category should have any semantic connection to each other, I saw each gaggle of words as a small family, united by a story. Take another look at the 丝 family: needle, hemp thread, matchstick, incense stick. Doesn’t this sound like the jumbled contents of a kitchen drawer? On the other hand, the members of the 片 family (wheat ear, lamp shadow, axehead, willow leaf, fish gill, fingernail, ox tongue), ￼￼￼￼￼￼￼￼￼￼￼￼￼￼￼￼remind me of the small treasures that a budding naturalist – young Goethe, perhaps – might keep in an old cigar box. How about the eclectic items of the 块 clan? Chrysanthemum, lychee, Buddhist clapper, pine cone, flag, domino, comb. These, of course, would be the forbidden keepsakes of a courtesan-turned-nun. Wordless symbols of her former life, objects fraught with emotion and courtly implications. Lastly, all the slender-yet-substantial 条 objects sound like the terms that Chinese calligraphers use to describe brushstrokes. Phoenix tail, wheat tassel, eyebrow, tusk, chopstick. Can’t you just see the ink soaked up by the thirsty paper – some tapering, others arched, still others steady enough to support a house? It’s all very poetic, these visual echoes of nature. 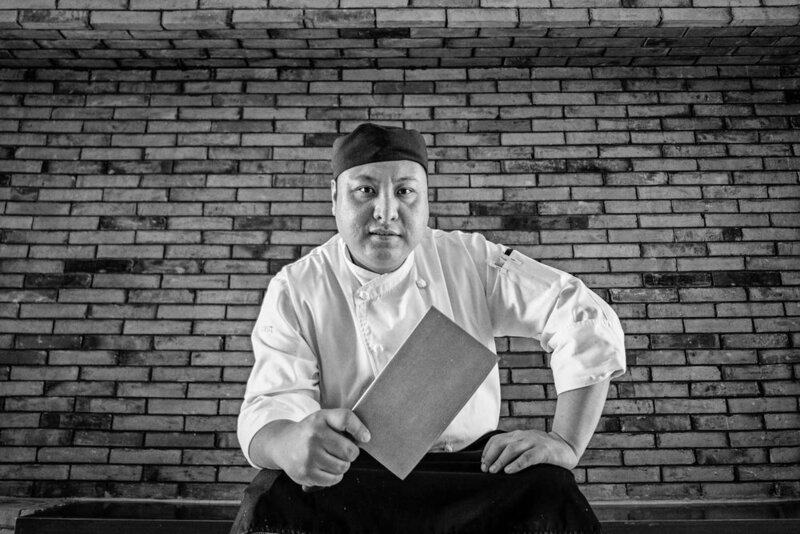 But what good is poetic mimesis to a chef at the chopping board? The vivid, naturalistic nicknames serve as shorthand for people who have already been trained, who are familiar with the entire family of slices, big to small. But there will always be some who do not yet know, who need to start at the very beginning. For such novices, numbers are the great equalizer – the tutor that never tires. Who will explain to the desert boy who has never seen the fine soft gills of a freshly caught fish? What of the child who grew up where willow trees never wept? The frostbitten lad who has never heard of the paper-hulled lychee fruit, much less seen one? The fisherman’s son who cannot imagine the tapering length of an elephant’s tusk? In teaching us how to cut, it is not enough for the culinary encyclopedia to show us (with word-pictures of winsome shapes that could have been taken from a child’s picture book); it must tell us as well (with efficient, brisk, charmless numbers). To leave no doubt about the appearance of these cut shapes, the culinary encyclopedia provides specific-to-the-millimeter dimensions. The incense stick 丝 should be 8-10mm long and 3mm thick. The proportions of an ox-tongue 片 range from 10cm x 2.5cm x 0.06cm (small) to 17cm x 3.5cm x 0.1cm (large). The domino 块 can be as big as 6.6cm x 3cm x 1.5cm. Chopstick 条 is about as square as the utensil itself at 0.7cm x 0.7cm, but no longer than 4cm. I am imagining a measuring tape being unrolled in a kitchen ... and I am laughing. Are we really meant to double-check the dimensions of every sliver? We might as well convert a paper cutter – with its ruled grid and long scything arm – for use as a chopping board. The very idea! And yet the persnickety precise does coexist with the practically poetic. For an example, let us turn to Yangzhou, a city famous for its “three knives.”3 The blades in question are the razor, the pedicure knife, and the cleaver. Think of them as metaphors for the three industries that flourished in the city: barbering, the baths, and cookery. One famous showcase of that cookery is a dish called dazhu gansi 大煮干丝 (stewed bean curd threads), a deceptively simple entree in which a heap of julienned tofu is served in a broth concocted from chicken, shrimp, ham, and lard (or crab oil). The dish is a perfect showcase for a chef’s knife skills because pressed tofu (doufugan) presents unique challenges as a cutting matrix. It yields, but it tears. It’s sturdy enough to be shaved exceedingly fine, at which point it becomes exceedingly frangible. According to tradition, from a 2.5-inch block of pressed tofu, an accomplished chef is meant to be able to produce up to 42 片 slices “as thin as paper,” then render those into 丝 filaments “as fine as a hair, capable of threading a needle.” When done right, 大煮干丝 ends up looking like a moist haystack – tousled, dishabille. Say what you will about curds, but they tend to be quite tidy. To render them disheveled is a feat. Hidden among the mundane wonders that Googling turns up is a recent syllabus for a knife-skills course at the Nan-Jeon Institute of Technology in Taiwan. The first week of class is rightfully devoted to safety guidelines and discussions about how to maintain one’s knives. In Week 2, when the students finally take their places at the chopping boards, what is the first thing they practice? Yes, that’s right: cutting doufugan into 丝. Will the students achieve wafer-thin tofu threads by the end of the semester? Maybe not, but you can bet they’re counting their slices. But why hold a class at all? Why not just list all the exact-to-the-millimeter specifications in the Nan-Jeon Institute class syllabus and send the kids home to practice? How else can a master be sure that his students are genuinely motivated to learn unless they take the initiative to “read ahead”? What’s more, one can hardly steal a skill without engaging in the richly analytical act of self-tutorial. The student must explain the untried skill to himself in a way that makes sense – breaking down the task into microgestures and reconstituting it in his own hand, trying repeatedly and erring almost as often, until his own movements become both powerful and efficient. A measuring tape might allow an ambitious home cook to certify her own knife skills as fabulous. Should she aspire to take those skills outside her own kitchen, however, she’ll need to subject herself to the masterly gaze and the instructor’s rubric. And that instructor will evaluate her by using a standardized performance metric, looking for 丝 片 块 条 test “results” thin enough to feed into a Scantron machine. Personally, I like to think of the technique of knife skills being measured not in millimeters but in gasps. There are many ways to make the masses marvel. “In the time it takes for a piece of paper to burn completely, a cook was able to cut a cucumber into 180 slices.”5 Presumably of identical thinness. Rapid and precise, what a combo. Chop chop! This feat was recorded in a biji xiaoshuo (literally “notebook tales”), a genre of Chinese literature that specialized in the lurid and miraculous, a breathless documenting of legendary feats. How reliable a source are they? Let’s just say that these notebooks were more like a storyteller’s Moleskine than a reporter’s steno pad. Any genre that contains supernatural tales (e.g. Pu Songling’s Tales From Makeshift Studio, which includes stories of fox spirits wearing the form of beautiful maidens) will, to modern eyes, appeal more to credulity than credibility. In other words, biji xiaoshuo was a forerunner of supermarket tabloids. How better to prove your chops than by using the body of a willing volunteer? This chopping board must not be chopped; you’re not allowed the luxury of putting your weight behind it. Instead, you must impel and then immediately annul momentum. When it comes to sangfroid slicing, one man stands alone: Cook Ting from the Taoist classic Zhuangzi. Cook Ting was cutting up an ox for Lord Wen-hui. At every touch of his hand, every heave of his shoulder, every move of his feet, every thrust of his knee – zip! zoop! He slithered the knife along with a zing, and all was in perfect rhythm, as though he were performing the dance of the Mulberry Grove or keeping time to the Ching-shou music. Cook Ting laid down his knife and replied, “What I care about is the Way, which goes beyond skill. When I first began cutting up oxen, all I could see was the ox itself. After three years I no longer saw the whole ox. And now – now I go at it by spirit and don’t look with my eyes, Perception and understanding have come to a stop and spirit moves where it wants. I go along with the natural makeup, strike in the big hollows, guide the knife through the big openings, and follow things as they are. So I never touch the smallest ligament or tendon, much less a main joint. It’s not simply that Cook Ting takes the carcass apart with uncanny deftness. The marvel is that he does it with minimal thinking and minimal effort. The unfading keen edge of his cleaver testifies to his ease in technique. Instead of sawing, he nudges apart – unpinning membrane from meat, sinew from skin. And he does it by listening. Cook Ting’s phenomenal technique is barely observable, since his movements are guided by feel. The entire universe sinks into the vanishing edge of the blade, which is pulled along the meat’s natural lines like a subtle mandate, so that even the minutest resistance redirects the blade’s path as gently as water is persuaded to flow down a channel. Essentially, what Cook Ting describes is butchering as an act of dowsing: his having become magnetized to the ley lines of the oxen body. Good luck stealing that. When we recap these knifely feats (vertiginous velocity, mind-boggling restraint within strength, effortless subtlety), they are all very impressive, but I see something else that unites them. To some degree, these feats resist strict measurement. (Imagine electrodes and accelerometers attached to those cleavers or that wrist ... and feel all the romance draining away as quickly as a dream being actively committed to memory.) One is almost tempted to call these feats “pre-scientific,” but that would imply that nobody had ever measured “correctly” before the boys of the Enlightenment with their vitreous empiricism and pasteurized cogworks. And we all know that measurement has existed ever since cavemen had hands to hold apart (“I’m telling you, Og, it was this big.”) No, best to call this type of amazing knife feat merely “pre-modern” and leave it at that. What else do the feats have in common? They seem very traveling sideshow or Evel Knievel. You can imagine them illustrated in Ripley’s Believe It Or Not! Such showmanship implies an audience to show off for. Wouldn’t you want to see for yourself the child’s unbruised back (post-chopping) – why, his skin hasn’t even been pinkened! Or the blur of the knife demolishing a cucumber while lit parchment shrinks into an ember crisp – as your incredulous gaze darts back and forth between the two. And surely I’m not the only one who longs to see Cook Ting waltzing around the ox, eyes closed, tracing lines like incantations ... until the mass of flesh suddenly tumbles apart with a satisfying flop. In short, those feats were still measurable on a human scale – they must be confirmed with your own sharp intake of breath. But feats have changed, haven’t they? We’ve become accustomed to split-second world record-breaking, where the authority is only a clock and maybe an adjudicator from Guinness World Records. What gets lost is the ability to personally evaluate and to recognize greatness. It’s no longer a matter of “seeing is believing.” Nowadays, when you see a feat of strength or speed or precision, you ask “Was that good?” and wait for something else – the stopwatch or measuring tape – to tell you yes or no. We’ve given over authority to our tools – depending on them to judge the difference between gross and fine. Machines tell us what’s superlative nowadays. There’s a limit to what flesh can observe or measure. Was there ever a limit to what flesh was willing to believe? The shift happened gradually (in the West, anyway). One scientific milestone, then another, and another. Lenses were ground finer, circuitry shrank. Natural philosophy, in which objects that could be observed unaided were named after each other in the vernacular, ceded ground to empirical science, in which objects were known by their numbers. The observable realm was expanded thousandfold by means of tools and technology ... and we became reliant on those macro eyes and micro ears and omnipossible fingers. Step aside, verifying master. You’ve been usurped. The student bows to numbers now. The needle 丝 is 10cm long and 1 mm thick. The fingernail 片 is 1cm square, with a thickness of 0.2-0.3mm. The chrysanthemum 块 is 1.6-2.6cm thick, with the knife incisions 3/4 through the ingredient, and spaced 3mm-6mm apart. The finger 条 ranges from 6cm long and 1.3-1.6cm square (large) to 5cm long and 1-1.1cm square (small). Some would say it’s naive to be nostalgic for a less exact age. Those same people would point out smugly that our present-day quality of life relies heavily on standardization. All this I fully admit. Then again, who says that intuition is an enemy of precision? There are artisans – designated “living national treasures” for their craft – whose intuitive know-how (体会 tihui) has made them, in some cases, more precise than machines. What are the odds that the average kitchen newbie will become a living national treasure? Assuredly low. Still, every such master must have started his career with the act of direct observation. The disciple is meant to see for himself. Just like a spectator. Let me show you one final feat. Meat sliced so thin that it allows light to trickle through. Like Yuan Zhen, we can discover for ourselves this optical law: The closer the light source, the larger the shadow an object casts. A master chef could use a backlit wafer of brisket like a transparency on an overhead projector. Maybe as a lesson to novice chefs at their chopping boards. He could make the shadow huge, loom over the room, darken an entire wall ... suddenly, everybody would be awash in a veil of meat-flavored light, aswim in its grain. Laughing in astonishment, a few may be struck by the superb irony: Are we not meat, ￼studying meat? can be sharpened for precise knife work, the flat can be used for pounding and mashing aromatics like garlic and ginger, the rounded handle is used as a pestle for grinding spices, the blunt back edge is used for tenderizing meat, and the wide flat blade makes it ideal for transferring chopped ingredients from cutting board to wok. Food Of China author E.N. Anderson goes a step further. Keep the edge sharp, he says, and you can dispense with pencil sharpeners, razor blades, and fingernail clippers. If you crack your hatchet, that other all-in-one tool, your cai dao will shave kindling and even split firewood. And your cleaver, brandished threateningly, can be an effective mediator of interpersonal disputes. 1. 川菜烹饪事典 / 李新主编. 重庆:重庆出版社, 1993 (2007 重印). pp259-265. 2. 吃到公元前: 中国饮食文化溯源 / 张宇光主编. 北京:中国国际广播出版社, 2009. p12. 4. With thrashings – another time-honored East Asian tradition. 7. From Chuang Tzu: Basic Writings, by Burton Watson (translator). Copyright © 1964 Columbia University Press. Reprinted with permission of the publisher. 8. Centuries later, the neo-Confucianist philosophers would use li 理 conceptually, to mean the natural order of things, the organizing principle visible in the structures of all living things. It reminds me of how natural philosophers of medieval and Renaissance Europe discerned patterns in the natural world, and in those patterns the hand of the Divine. Everywhere they looked – the human body (four humors), the plant world (doctrine of signatures), the skies (Copernican cosmos), and the earth (geomancy) – they too saw evidence of intelligent design. 9. 南方饮食典故/竞鸿主编.天津:百 花文艺出版社, 2004. p479. Lilly Chow spends her leisure time researching colloquial and classical Chinese food writing, and exploring regional cuisines.